The Kawhi Leonard saga continues, with NBA teams now circling the Spurs and waiting for a trade. The Open Floor podcast discuss potential landing spots. Without Kawhi Leonard uttering a single word, the saga in San Antonio continued to gain steam over the week. 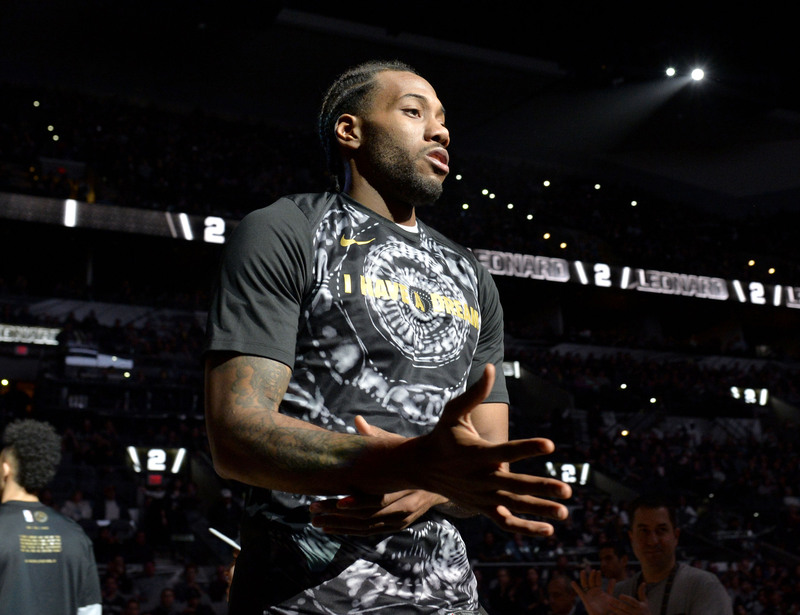 NBA teams are starting to circle Kawhi Leonard and preparing to pounce with trade offers when the moment is right, according to ESPN's Brian Windhorst. With that report in mind, Andrew Sharp and Ben Golliver of the Open Floor podcast weighed in on potential landing spots for Leonard. Andrew Sharp: That Houston win was very impressive, but how can we be expected to talk about the actual Spurs games when Kawhi Watch continues to escalate every single week. So where are you on Kawhi Watch? You can mention the Spurs if you like. Ben Golliver: Look, all the ladies out there. If your husband wants to have an apartment in the city for work, that's a red flag. If he lives with you at a house but he says I need an apartment in the city for work ... red flag. It's probably not for work. If Kawhi is leaving San Antonio to go back to New York again, to his apartment in the city in New York, that's a red flag. I've been trying to do some digging on this and no one really seems to have a great idea of what's going on with Kawhi Leonard, but I do have one more theory I want to throw out for you, Andrew, and you tell me if you think this passes the smell test in terms of what's been going on. Because it's been a back and forth. It's almost like they're negotiating. "Is he going to be there?" "I'm coming back to San Antonio." "I'm going to a players' only meeting, things fall apart." "I'm out of there, I'm going back to New York." It's a real saga. So what if this is the situation. ... If you're Kawhi's people, your big concern is not compromising that supermax contract next summer, right? What if you get to a situation where you're like, 'Look guys, we know you want him back this season. You have a shot at the Western Conference Finals if he plays. We understand that. But if he plays there's a risk of injury. We want to make sure that supermax is still going to be there for him this summer if he happens to get injured." Doesn't that seem like a possible impasse, Andrew? If Kawhi's people put that to San Antonio and you're the Spurs, can you just automatically write that supermax contract no matter what happens to Kawhi? I mean, if that quad injury comes back again and he misses significantly more time and it adds on to this previous injury history, is Kawhi necessarily a no-brainer supermax guy when you've already seen what's happened to Blake Griffin, John Wall, even Russell Westbrook, to a certain extent? When you look at how huge those contracts are, you have to at least pause for a little bit. So I can see a situation where at some point they said, "Hey, we want assurances on the supermax," San Antonio said no and then Kawhi's people said, "Cool, we can't bring him back." I could easily see that being the way it played out. What do you think? Sharp: Well, I like that theory a lot, and I think it dovetails nicely with something that I heard last week when the Spurs were in D.C., where it was just someone spit-balling but basically theorizing that Kawhi trusted the Spurs when he came back during last year's playoffs and he physically hasn't been right for more than a year now. He trusted the Spurs when they said, "You're good to go, come back." And then he reinjured himself in that Warriors series, and it's possible that in Kawhi's mind he wasn't ready or he thinks he wasn't ready and he sort of connects the injury, even though to me it sort of looked like a freak accident. But basically the idea is Kawhi doesn't totally trust the Spurs' doctors, and it's possible that that's true in conjunction with him wanting a guarantee on the supermax deal that would be waiting for him. Look, I totally agree, we've talked about this all season long. Those supermax deals hurt teams as much as they help them, and it wouldn't surprise me if the Spurs are sitting there kind of calling Kawhi's bluff to some degree. Or also saying, "Look, we really like you but we need to see you play before we commit $220 million to you over the next five years." That's a big ask even if Kawhi is healthy and dominant, but given the way this season has unfolded, I don't blame them at all for feeling a little bit reluctant. Golliver: And, again, we're speculating here, but if you're San Antonio and you've kind of put this on the table it's a negotiation. You're saying, "Look, we're not going to give you that guarantee, but we would love to have you back on the court. We've paid you max-level money on your second contract, we've supported you throughout your career, guys like Manu are openly weeping in the press about you returning. Just come back and be a team player and trust us that we're going to work this out." And you can understand why that would be a reasonable position for them to take. And if Kawhi just says no or his people say, "No, we don't trust you. We want a guarantee," you can see why that would be an impasse. To me it's the most plausible theory that I've heard, and, again, it would also explain, to a certain degree, Kawhi's reluctance to talk about the situation, right? Because if he came out and said this is where we're at, that would not make him look good. People would say, "You've got to go earn your next contract on the court." I'm not saying that would be a fair interpretation, but that's what the public sentiment would be, don't you think? Sharp: Well, alright, fine. But I also think that you're kind of burying the lead here because what you really think is that the Spurs have been pushed too far and that this ends with Kawhi getting traded in the next three or four months, which is now being echoed from other reporters. I think Brian Windhorst reported that teams are circling the Spurs and ready to pounce in case Kawhi is available this June. So do you really think that's a possibility? I think we've both kind of been there and been wondering about it for a while, and where do you think he could go? Golliver: So I'll put it this way: At the All-Star break if you have asked me I'd say no chance. At this point, based on stuff that I've heard and just the way that it has dragged out, how weird it's been, and also the fact that you have to have a rock-solid relationship with your supermax guy. You have to have that hometown hero, no cracks in the armor relationship to invest supermax money, because you're saying this is our entire franchise for the duration of that deal, we're building around him. Otherwise, you get into a situation like Wizards fans, where you're like, "Oh my God, how many years left on Wall's deal?" You don't want to be there if you're a smart organization. Sharp: Hey, let me tell you something, John Wall came back this weekend, he looks 15 pounds lighter, he looks great and I'm all the way back in. So we'll get to that later on this spring, but I'm not here to complain about John Wall. That was a great, great contract. Golliver: OK, for once you're not, the last six months tell a different story. But look, I think San Antonio, if their thinking hasn't shifted from the All-Star break, that would be surprising. And I would be more surprised if there were not Kawhi trade rumors this summer than if there were, and if you're San Antonio I think it becomes tricky because he's in that situation where he does hold a lot of the cards, right? I mean, there's basically one year left on his contract if you're trying to trade him this summer. You have no idea what's going on in his head because it's been such a weird circumstance. Do you trade him somewhere he wants to go to maybe get better value? Do you maybe just dump him off to a sad-sack team with picks and young prospects coming back and you just sort of build with whatever you can that way? You're also under the gun because guys like LaMarcus, Pau Gasol, even Patty Mills, people who you've paid, those guys expect to win now, right? So there's not really the chance of a true rebuilding window. So that will be an insane negotiation, and it will also be fascinating to see what kind of price he gets. Because I've seen some of these Kawhi trades floating around on Twitter. I think they would be able to get a lot less than sort of these A-list prospects that people are trying to include. A guy like Jayson Tatum is a popular name out there. Do you actually think in a Kawhi trade San Antonio would be able to pull Tatum right now, given that he'd be entering Year 2 of protected contracts that would go on for eight or nine years? And he would be cheap throughout that entire time period? It pains me to say this because I am a fan of Kawhi Leonard's game, but the way things have played out I think he's really hurt his trade value and he's put San Antonio in a tough situation. Sharp: There's too much uncertainty with his health, and who knows what the real story is behind the scenes. But he didn't look great when he came back for those two weeks when he came back in the middle of the season, so I think the most reasonable worry about his health is going to be a factor in any trade discussion. Golliver: Well, it should. He's never played 75 games in his career. That's a red flag right there. Sharp: That, coupled with the impending free agency, is going to drive the value down a lot. Because even if Kawhi commits, a team like Boston isn't going to be overjoyed about throwing another massive deal at somebody when they already have Hayward on their roster. It's messed up, but from Boston's standpoint, it would make the most sense to trade Hayward, which they definitely won't do because it would be the most heartless move of all-time after the Isaiah Thomas deal. But that makes sense on paper at least, but I agree with you that it seems pretty far-fetched that they would trade Tatum for Kawhi. And I also think that if they trade Tatum it's going to be for Anthony Davis because the way they've been building that team it's pretty well known that the Celtics have their eyes on AD, and I don't think that they're going to be thrilled to roll the dice on Kawhi. My favorite idea that you had was an idea of a spite trade to the Phoenix Suns, our favorite team in the league, where they get back Josh Jackson and Dragan Bender and just ship Kawhi out to the desert. Golliver: That would be the, "Look, Kawhi, you crossed the family. We're done with you and we're not going to work with you and we're getting out in front as fast as possible and we don't want to try to repair this and we're just going to try to trade you to the thirstiest GM who needs talent to try to save his job and we're going to try to poach whatever young assets we can poach." But notice the name you didn't mention, which is Devin Booker, and again, I don't think that if you're trading Kawhi Leonard this summer given the circumstances you can get that true A-list level prospect. 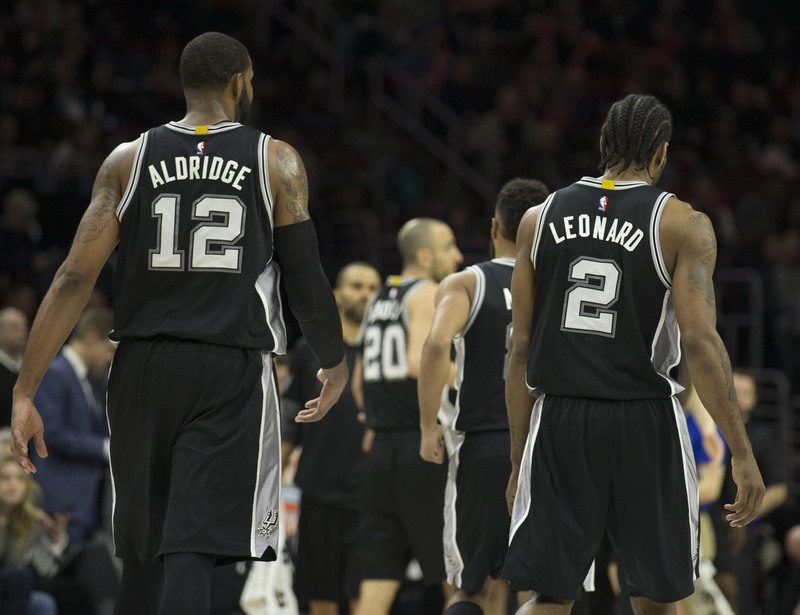 You're probably settling and that's where it gets to be a dicey thing for the Spurs. Does that urge you to go back toward hardball? With LaMarcus they had to just have that frank conversation and be like, "Look, we can't get what we want for you so we can't trade you." The same thing could happen with Kawhi where they go surface the market, there is no A-list prospect out there and they have to go back to him and say, "Look, we have to find some way to figure this out, man. We could still offer you more money than anybody, let's do this." But it's so hard to prognosticate just because Kawhi has not made his intentions known, but I would just say he has a lot of leverage here. These trips to New York are huge red flags, leaving the team during the season is a huge red flag and it does feel like his people could be trying to position him for an exit, and I guess the smart GMs would be circling this, trying to buy low on Kawhi Leonard, trying to throw those garbage offers out there to snag him and see how that plays out. Sharp: Let's throw a couple more out there. What about Miami, if they put up Josh Richardson and Justise Winslow and some salary filler. Do you think a deal built around those two would work? Golliver: To me, that is the right ballpark, and I'm sure there are going to be listeners who are swerving off the road in traffic or dropping the soap in the shower, just losing their minds. Sharp: There's not a lot of examples of superstars bringing back fair value, particularly with free agency looming. So we should start from the assumption that the Spurs are going to get 50 cents on the dollar at best. Golliver: That's very important. And I think you also start with the assumption that they're going to want picks and they're going to value that heavily, because they built their entire championship, 20-year core off of draft-pick guys. That's going to be thrown in too, but I think you're now in the right area. But when you start imagining some of these players, like a Josh Jackson or a Richardson in San Antonio--and that's no offense to Miami, it is an offense to Phoenix, by the way—those players start to sound better as Spurs, don't they? Sharp: And I think we would be remiss if we didn't mention the Lakers' potential, right? Because the one blue-chip prospect that could be available maybe, possibly is if the Lakers put Brandon Ingram on the table. I don't even know if they would have to attach him to Lonzo or Kuzma in that scenario. It would kind of depend on how competitive the market is, but I could see that maybe working for both sides, and if I were the Spurs, to come away from this Kawhi saga with Brandon Ingram to build around for the next 10 years, I think that would be a massive, massive win. And, honestly, probably preferable to paying Kawhi $220 million over the next five years. Golliver: If there is one front-office guy who is going to say, "I don't care about this recent standard of paying 50 cents on the dollar for superstars, just get me the superstar," isn't it Magic? Wouldn't that be Magic's mentality? "Sure we can groom Ingram for three or four years or you could just get me Kawhi Leonard, I'll give him max money right now. We've got a building block for the summer." That would make a lot of sense for them if they start to feel like they're not in the LeBron James sweepstakes. That's a really good backup plan. No one's calling you a loser of the summer if you come away with Kawhi Leonard. That's a top-10 talent when healthy. For the Lakers that would be a huge win. But fit-wise, again, does Kawhi's personality hold things back? Can you pitch a team built around Kawhi Leonard, if he's your best player and he's not willing to be marketable and he's not willing to be the face and he's not willing to do interviews? That franchise is just obsessed with all those things, so that's kind of a weird fit too. That would give me pause a little bit, and again, people are going to think I'm killing or crushing Kawhi Leonard here. I'm not. These are just facts that we have to admit right now based on how this season has gone. Sharp: And you are a little disappointed in the way this has done. As a longtime Spurs acolyte, I think you're bummed that Kawhi has chosen to play it this way. Correct? Golliver: Well, I would be for almost any franchise. If he's healthy, and again we don't know, but if he's healthy and is just choosing to stay away. And I personally believe that he is able to take the court right now, because if he wasn't we would not be hearing the type of stuff we've heard from their front office or their coaching staff, and then also Tony Parker and Manu Ginobili. Those guys know how to keep things in-house, and they've been taking pot-shots at Kawhi. Sharp: And you also have to consider the team we're talking about. The Spurs take the long view more than any team in the league. They're not the team that's out here rushing guys back. Over the last five or six years, they have sort of pioneered rest. So if they feel like he's ready to play chances are he is. Golliver: Not only that, they take care of their players on the contracts. And so if it is this big impasse over the supermax deal, I mean, every single guy who's gone there and earned the money has gotten paid, right? That's why guys stay there forever. They find a deal that makes sense and sometimes even convince people to take discounts to stay there because the situations are so favorable. So I'm disappointed in Kawhi because he's not explaining his side of the situation. Either he's getting bad advice or he doesn't have a side that he wants to share publicly or he doesn't feel like he can share it because he'll get killed for it. That's disappointing, but also all the warning signs are there that they've kind of turned on him. And that's tough because he was supposed to be a Spur for life. That was the story, and that story got blown up pretty hard this season.